Meenakshi Amman Temple is a historic Hindu temple located in the South Indian city of Madurai in Tamil Nadu. 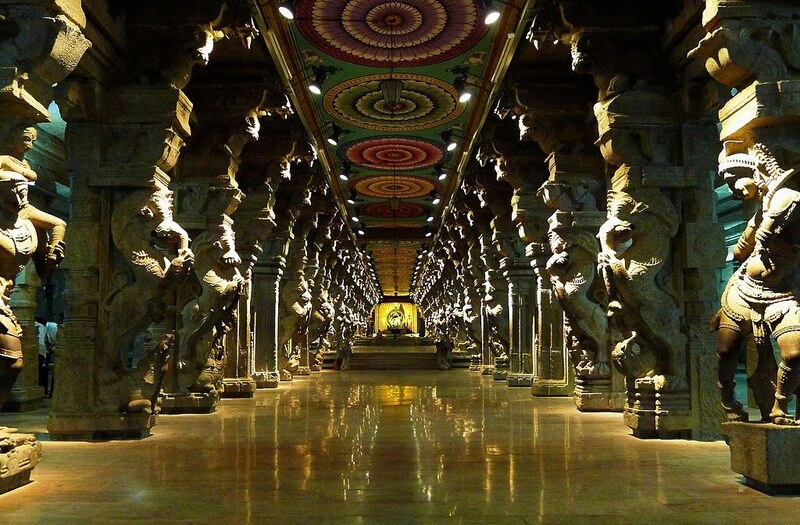 It is dedicated to the Goddess Parvati, known as Meenakshi, and her consort, Lord Shiva, here named as Sundareswarar. The temple is a significant symbol for the Tamil people, mentioned since antiquity in Tamil literature. There are more than 33,000 or so sculptures in the temple according to the archeology department. 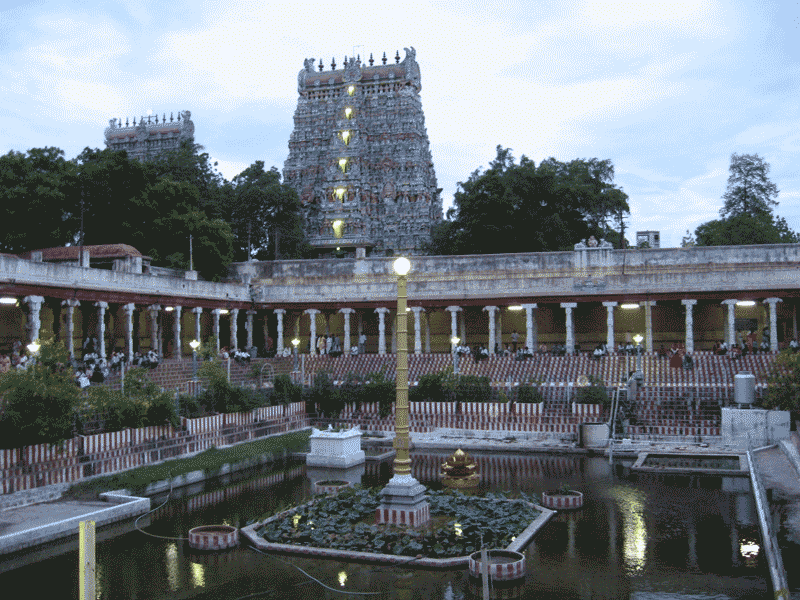 The annual ten day Meenakshi Tirukalyanam festival, celebrated during April and May, attracts nearly a million visitors. The wedding of Meenakshi and Sundareswarar. The goddess Meenakshi is the principal deity of the temple, not Sundareswarar, unlike most Shiva temples in South India where Shiva is the principal deity. Meenakashi is the avatar of the Hindu goddess Parvathi,the consort of Shiva,and one of the few Hindu female deities to have a major temple devoted to her. The name "Meenakshi" means fish-eyed and is derived from the word 'meen' (fish in Tamil language). According to Hindu legend, in order to answer the prayers of the second Pandya king Malayadwaja Pandya and his wife Kanchanamalai, Parvati appeared out of the holy fire of the Putra Kameshti Yagna (performed by childless couple) performed by the king. The girl who came out of the holy fire had three breasts. A voice from the heavens told the king not to worry about the abnormality and added that the third breast would vanish as soon as the girl met her future husband. The happy king named the girl "Tadaatagai" and as the heir to the throne, Tadaatagai was trained in all the 64 arts. As the time came for Tadaatagai's coronation, she had to fight a war in three worlds encompassing eight directions. After conquering Brahma's Abode, Sathyaloka, Vishnu's Abode, Vaikunta, and Devas' abode Amaravati, she advanced to Shiva's Abode Kailasha. She very easily defeated the bhoota ganas ( Shiva's army) and Nandi, the celestial bull of Shiva, and headed to attack and conquer Shiva. The moment she looked at Shiva, she was unable to fight and bowed her head down due to shyness, and the third breast vanished immediately.Tadaatagai realized that Shiva was destined to be her husband. She also realized that she was the incarnation of Parvati. Both Shiva and Tadaatagai returned to Madurai and the king arranged the coronation ceremony of his daughter, followed by her marriage with Shiva. The marriage was to be the biggest event on earth, with the whole earth gathering near Madurai. 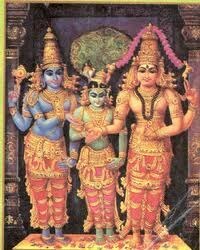 Vishnu, the brother of Meenakshi,travelled from his holy abode at Vaikuntam to preside over the marriage.After the marriage, the pair ruled over Madurai for a long time and then assumed divine forms as Sundareswarar and Meenakshi, the presiding deities of the temple. Following the tradition, every evening, before closing the temple, a ritual procession lead by drummers and a brass ensemble carries the image of Sundareswarar to Meenakshi's bedroom to consummate the union, to be taken back the next morning in dawn.The marriage is re-enacted and celebrated annually as Chithirai Thiruvizha, refer, AlagarKoil in Madurai. Though the date of the temple dates back to several hundred years ago ,the present structure was built between 1623 and 1655 CE. It houses 14 gopurams (gateway towers), ranging from 45-50m in height. 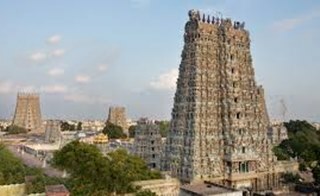 The temple has four Rajagopurams or gigantic towers .The grand main tower at the entrance is believed to have been built by the Pandya Kings.These have nine tiers each. According to the historical scriptures, Malayadhwaja Pandyan, son of Kulasekhara Pandyan, was the earliest known monarch to patronize the temple. Sundara Pandyan beautified the 'vimana' of the shrine with gold plates. After the Pandyas rule, the Nayakas patronized the deity.The tallest is the southern tower built in 1559 CE is 152 ft high, and the Eastern tower was built by king Sundarapandian during AD 1216-1238. There are two golden sculptured vimanas, the shrines over the sanctums of the main deities. This beautiful pond is situated within the temple complex in front of Meenakshi sannidhi (sanctum). Lord Indra used to take golden lotus from this pond and offered to Lord Shiva and hence it became known as 'Potramarai kulam' ( Pond with golden lotuses). This theertham was created by Lord Shiva by thrusting his Soolam (the three ptonged spear held by lord Shiva) into the earth for providing water to the thirsty Nandhi and other deities. It was here, that the plank of Sangam appeared and established greatness of the Thirukkural. This pond is also known as Adhi Theertham, Sivaganga and Uthama Theertham.. This is also called Parama Theertham as Gnana Theertham because it brings prosperity on all who bathe in it. As it grants heavenly abode it is also called Mukthi Theertham and as Sivaganga because the water from Ganga from the head of Lord Siva confluences with it and as Uthama Theertham because of its purity than any other theertham. They charge you a fee for the camera, but it is worth paying. However ,there are certain areas where you are not allowed to take photos. Temple location It is situated at around 20 kms from Madurai. There are many festivals celebrated in this temple thoughout the year. Some of the most popular and important festivals of the temple are Chitra festival, Avanimoola festival, Masi Mandala festival, Float festival, and Navarathri cultural festival. The Chitra festival is celebrated for 12 days during the Tamil month of Chitrai (April in the English calendar) and begins with the flag hoisting on the first day. 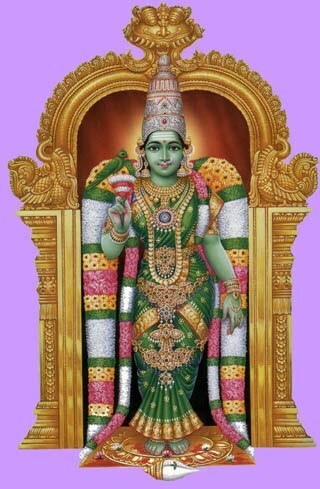 On the 8th day the coronation of Meenakshi Amman takes place. On the 9th day the Goddess is taken out in procession. On the 10th day the celestial wedding of Goddess Meenakshi and Lord Sundareswarar is enacted, followed by the car festival the following day, Theertha festival is celebrated on the 12th day with the Lord and Goddess going round streets around the temple. Deepam (lights) festival is celeberated for ten days during November. Lord would be taken out in procession along the streets. On the day of Karthigai hundred thousands lamps would be lit in the temple. 1)Madurai is well connected by Air,Rail and road. Where to eat? Variety of food available in various restaurants in Madurai. Madurai is known for the roadside idly shops that are open through the night. Most of the big restaurants serve you RO purified water, but excercise caution. Telephone 091- 452- 2344360. Email: info@maduraimeenakshi.org Other interesting places nearby Thiru Moghur, Alagarkoil, Pazhamuthir Cholai, Thiruparankunram,Thirumalai Nayak Palace, Vandiyur Mariamman. Best Season: Throughout the year. Summer( from May to July) could be very hot when the mercury shoots to 40 degree celsius.